Paul McCartney never wrote "Maybe I'm Amazed." He never formed the band Wings. He never clashed with Yoko, became a vegetarian, or fathered any of his children. When Queen Elizabeth knighted him in 1997, she was actually knighting someone else. This is because, conspiracy-minded Beatlemaniacs say, Paul McCartney secretly died in 1966. Theorists claim the other Beatles covered up his death  hiring someone who looked like him, sang like him, and had the same jovial personality. But the guilt eventually got to them and they began hiding clues in their music. In the song "Taxman," George Harrison gave his "advice for those who die," meaning Paul. The entire Sgt. Pepper's Lonely Hearts Club Band album was awash with Paul-is-dead clues: the Beatles had formed a "new" band featuring a fictional member named Billy Shears  supposedly the name of Paul's replacement. The album contained John Lennon's "A Day in the Life," which had the lyrics "He blew his mind out in a car" and the recorded phrase "Paul is dead, miss him, miss him," which becomes evident only when the song is played backward. Lennon also mumbled, "I buried Paul" at the end of "Strawberry Fields Forever" (in interviews, Lennon said the phrase was actually "cranberry sauce" and denied the existence of any backward messages). Paul-is-dead believers think the Beatles accompanied these backward tape loops and veiled references to death with album covers that illustrated the loss of their friend. 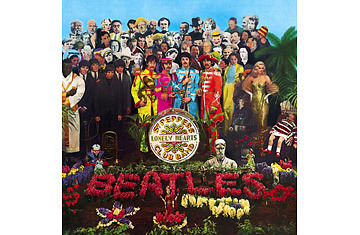 The original cover of 1966's Yesterday and Today album featured the Beatles posed amid raw meat and dismembered doll parts  symbolizing McCartney's gruesome accident. If fans placed a mirror in front of the Sgt. Pepper album cover, the words Lonely Hearts on the drum logo could be read as "1 ONE 1 X HE DIE 1 ONE 1." And of course, there's the Abbey Road cover, on which John, George and Ringo forwent all pretense and pretended to cross the street as a funeral procession. John wore all white, like a clergyman. Ringo, the mourner, dressed in black. George donned jeans, like a gravedigger. Paul wore no shoes (he didn't need them, because he was dead) and walked out of step with the others. If Paul is dead, then his imposter is still at large. He met and married Linda Eastman, with whom he had four children before losing her to breast cancer in 1998. He released a live album in 1993 called Paul Is Live (likely story), and produced more than 20 solo albums  and that's not even counting the ones released by Wings. Then he endured a horrible divorce from Heather Mills, which may have made him wish he were dead  or, at least, were still Billy Shears. So who is the real McCartney? The world may never know.